As you’ll be aware, the results of the annual DJ Mag Top 100 were announced Saturday night at the Amsterdam Dance Event. 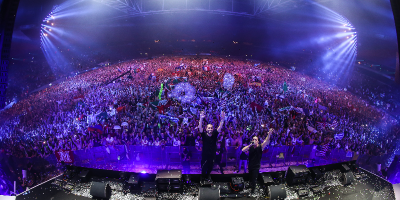 Each year, fans from over 100 countries vote online for their ‘favourite DJ’ of the past year and last year, Dimitri Vegas & Like Mike set a Belgian record with their 6th place on the list. This year, the two brothers from Willebroek held onto their place in the top 10, ascending to the top 3. Sandwiched between Dutch DJs Hardwell and Armin van Buuren, Dimitri & Mike have taken the 'silver medal', in second place. The DJ duo's Facebook page has nearly 6 million fans from Belgium and around the world. On Friday 19 and Saturday 20 December, the duo will be in Belgium to kick off their tour. In the meantime, all 20,000 tickets for the show on Saturday have sold out and there are just a few places still available for Friday.